I’ve written about this before – how an excess of choice can actually be more crippling than freeing. No place embodies this concept quite like the free will bonanza that is Faneuil Hall in Boston. 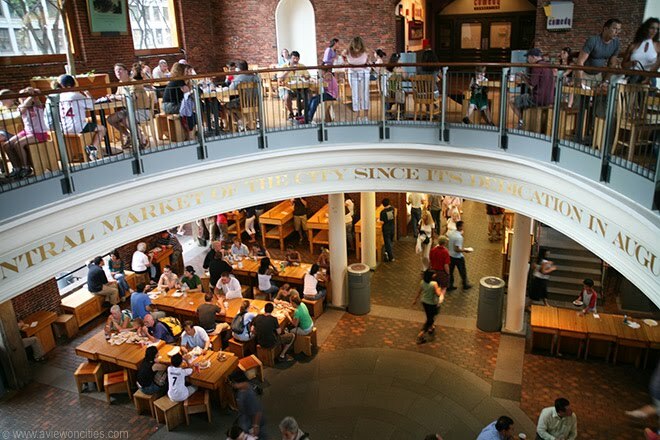 If you don’t live here, or have somehow managed not to visit the 2nd most famous tourist attraction in a city chock full of tourist attractions, Faneuil Hall is an all-pedestrian shoptropolis/engine of commerce in the heart of the city. It is perhaps the most shining success story in the mixed bag that was 20th-century urban renewal. Inside the main building is an extreme food court, a long corridor with vendors hawking just about every food imaginable at a pretty good mark-up. A hungry luncher ambling down that hallway usually wears the same expression as a 7-year-old at Toys ‘R’ Us on December 23. The possibilities are tempting and limitless. Which is why, after you’ve made your decision, found a free table, and eaten your lunch amongst the bustle… you can never be really happy with your choice. There are a couple of issues at play here. One is simple: mall food is mall food, even when it’s more upscale, and it always looks and tastes better before you eat the whole thing. Have you ever felt good about the orange or sesame chicken you just ate at the mall? No. Not once. But those samples are so tasty! But it also comes back to a much larger problem in our society, which threatens everything from day-to-day contentment to love and marriage: the overabundance of choice, and the fear of commitment and decision-making it leads to. 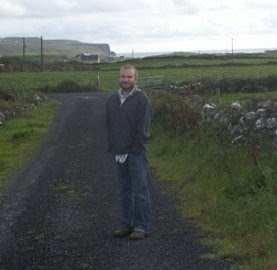 I’m willing to wager that around the world, young people who live in cities with a thriving singles scene have a much harder time settling down, and far more doubts about doing so, than their peers who live in small towns with few eligible mates or in places where arranged marriages are commonplace. Likewise, I’d bet that a 7-year-old who’s allowed to pick out any one toy from Toys ‘R’ Us will be racked with more doubt about his decision, and perhaps enjoy the toy less, than a kid who receives the same toy as a surprise without knowing all the other options he could have chosen. For the record, something compelled me to get a chicken cheese steak today -- why?! -- and I’ve regretted it ever since. Not that it wasn’t tasty. But I could have had chicken tikka masala! All this is to say that a friendly pub and a good pint know no off-season. So if you feel like ducking out of the sun’s scorching rays for a bit this Thursday evening, stop by the Irish Village in Brighton, where my friend Edgar and I – a.k.a. 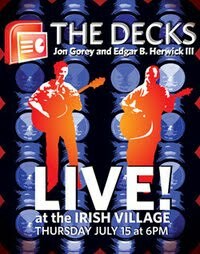 The Decks – will be performing our second-ever show from 6pm-10pm. Don’t worry, no one expects you to stay all four hours. Goodness, that would be crazy! Just pop in for a pint, a chat, and some music, bask in the breeze of the open windows (or the refreshing chill of the A/C, depending) for a bit, and then slip back out into the summer night’s balmy embrace. And if you do stay the entire four hours? Well, I'll buy you a beer for your trouble! Really!